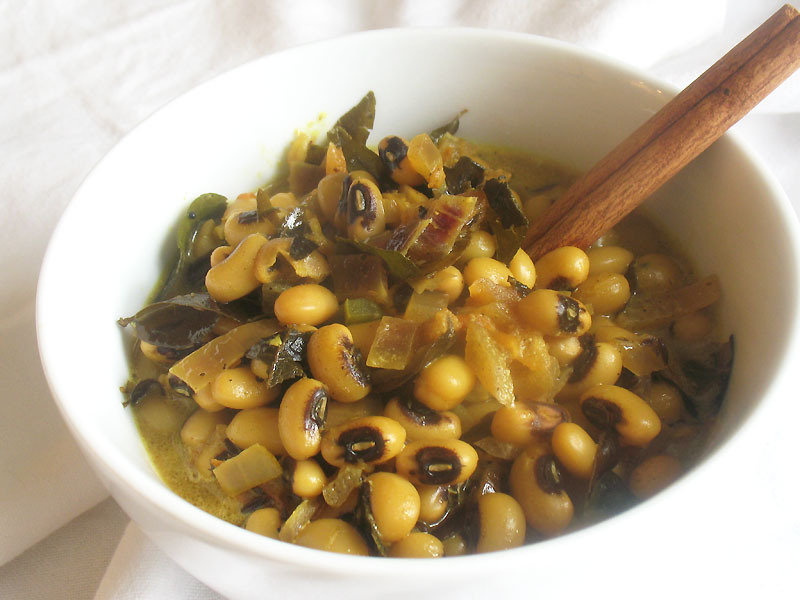 Serving black-eyed peas with collard greens is apparently good luck for the New Year. It's a tradition in the American South and around the world. 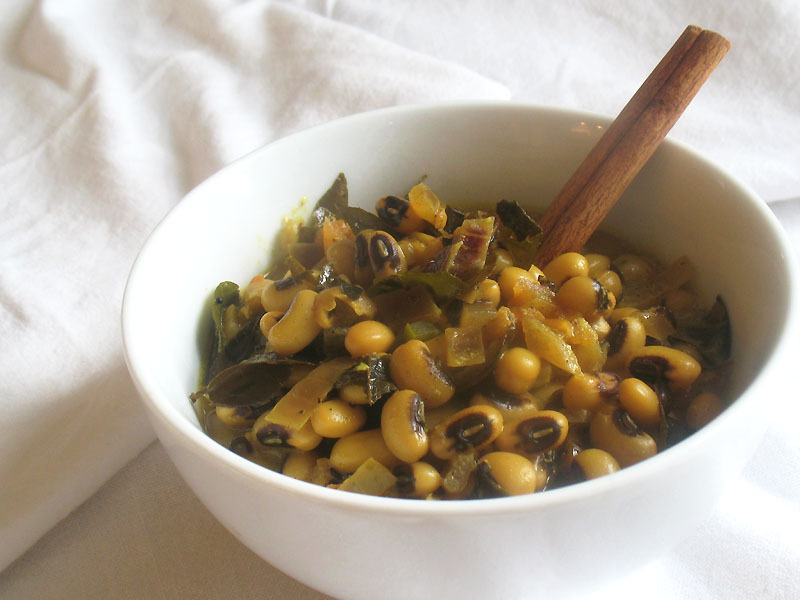 Because the beans swell with cooking, the peas are considered to represent growing prosperity in the New Year and are sometimes believed to represent coins and the collard greens paper money. Whatever you think of that tradition, the meal I served was delicious enough for me and my dining companions and even a more nourishing dinner served up with some rice. I steamed the collard greens and sprinkled them with a bit of sea salt. It's a snap to put together too, which is a bonus when you are tired from lack of sunshine. The black-eyed peas are moderately spiced with a bit of tangy tomato. 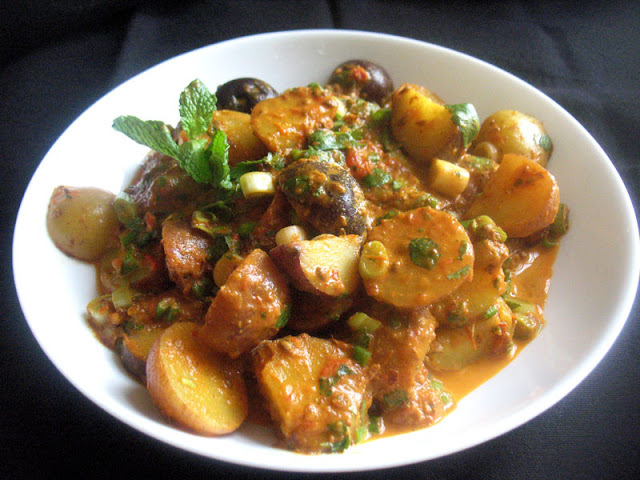 The addition of coconut milk reduces the heat besides but feel free to ramp up the spices if desired. Many of us indulge somewhat over the holidays, so a wholesome but fulfilling dinner is most welcome to ring in the New Year. That's good luck enough for me because money can't buy happiness or prosperity. 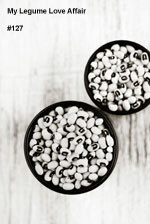 Rinse the black-eyed peas and soak for 6 hours or overnight. Drain and rinse, then transfer to a medium saucepan and cover with fresh water. Add the cinnamon stick and bring to a boil. Reduce the heat to medium-low and cover and simmer until the beans are tender - roughly 40 minutes. Drain and set aside. In the same pan, heat the oil over medium heat. Toss in the mustard seeds and cumin seeds and stir until the mustard seeds turn grey and begin to splutter and pop. Stir in the curry leaves and spices and fry for another minute or two. Add the onion to the pan and cook until softened, about 5 minutes. Add the chilies, stir for another minute, and then add the tomato and simmer for another few minutes to thicken. Stir in the black-eyed peas along with the coconut milk and water. Bring to a gentle boil and simmer, uncovered, until thickened to the desired consistency. Stir in the salt and black pepper and serve over piping hot fresh cooked basmati rice and steamed greens on the side. Happy New Year Lisa, yes we believe in having black eye beans on new year day too, sometimes we use fresh too , we call it 'Chori' this dish looks so yum. Happy New Year to you too Jagruti. Hope all is well with you. I would love to try this black-eyed peas recipe if only you said it helps bring good luck this new year. Looking forward to a great year in 2016 for all of us. Happy New Year to you Lisa. I could do with a bowlful of this now for my lunch. I do love black eyed peas and often make them for NY, but this year I broke with my own tradition and made butterbeans. Best wishes for the New year Shaheen. As ever a fabulous recipe Lisa. Low the flavours. Thanks for linking up. The roundup is live. This recipe looks so good. I had never heard of "curry leaves" before. First time I have ever cooked black-eyed peas! (I only know the black eyed peas band, not bean type!!) This was very delicious. Thanks for sharing. Black eyed beans and coconut is a winning combination. I prefer fresh curry leaves as I don't think dried ones add anything like the flavour. I am lucky as there is a market stall in Sheffield that usually has them. I like them in my dals and they are great in a coconut chutney recipe. I love South Indian flavours.